The Vodka Martini is a fantastic cocktail and the recipe is an easy one to mix up. It's the perfect way to show off a premium vodka like Ketel One, and the foundation for every other style of vodka martini. This is one of the super drinks of the bar scene and it's a cocktail that everyone should try and master. The Vodka Martini's popularity rivals that of the classic Gin Martini, which inspired it. It is the drink of choice for many who want a clean, dry martini without the aromatic botanicals of gin. Just like its predecessor, it can be adapted to suit your personal taste. Make sure that you are using the best quality vodka you can for this recipe, as there is nothing to cover the bad taste if you use a lower quality one. The Vodka Martini actually began with the name Kangaroo, as Paul Clarke points out on Serious Eats. The cocktail was one of those that U.S. bartenders created during the first big releases of vodka to the market in the 1950's. Many of the first vodka cocktails were just like this one: a gin cocktail recreated with a vodka base. Whether it was the public's changing tastes, their desire for a less aromatic Martini at lunch or the growth in popularity of vodka in general, the Vodka Martini became so popular that today you often have to distinguish which liquor you want when ordering a Martini. The key to a great Vodka Martini is the vodka. It seems like that would be an obvious statement, though it warrants repeating. The vodka you choose will either make or break this cocktail because there is nothing here to disguise a bad vodka. The words "cheap" and "Vodka Martini" should not be used together. There are plenty of mixed drinks that can save you money (i.e. Screwdriver, Madras, etc.) and allow you to get away with any vodka you like. This is not one of them. Use the best vodka you have in the bar and keep the Vodka Martini in mind as you explore the vast vodka market. It is a great drink for testing out new premium brands. 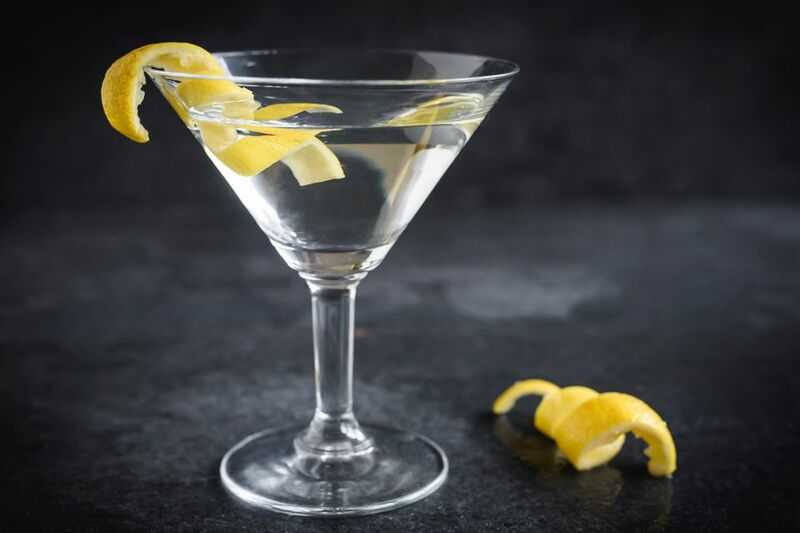 Over the years, the Vodka Martini began to lose its dry vermouth to the point that it often didn't even make it into the glass (despite the contradiction, this is called a "Dry Vodka Martini"). However, the simple ratio of around 3:1 vodka-vermouth gives the drink some depth. Of course, you can adjust this to your taste. Keep at least a hint of vermouth, otherwise it is simply vodka straight up. If vermouth is not your favorite, you can always rinse the glass with it and dump out the excess. It's more like seasoning the glass than anything else and you may find that you really enjoy it. Experimentation is great and as mentioned above, today's vodka market has opened up a whole new world of options for our martinis. As you explore the various brands, you may need to tweak the ratio a bit to find the perfect recipe for each combination. It is something that each drinker has to play with and explore for themselves. Let's be honest; finding your ideal Vodka Martini is not the worst task in the world! Some enjoy orange or aromatic bitters in my martinis because it adds depth. We list it in the recipe as optional. You might also play with some of the new bitters on the market. Though minimal, lavender, lemon and peach bitters each put a new spin on this drink. Even celery can make an interesting Martini. Your last option for the Vodka Martini is the garnish could be either a light lemon twist or a few olives. Both garnishes add an extra layer of flavor to the otherwise transparent cocktail and, once again, this is going to be a personal preference. There is an old bar superstition that an even number of olives is bad luck, so we typically go with either one or three olives for the garnish. To further add to your options, you can also choose between the standard pimento or a gourmet stuffing like blue cheese or jalapeño. How Strong Is the Vodka Martini? The Vodka Martini follows suit with the Gin Martini, Manhattan and other spirit-vermouth cocktails. These are not light drinks. With an 80-proof vodka and 15 percent ABV vermouth in this recipe's ratio, we can estimate it to be about 28 percent ABV (56 proof).